Listbox creates a list of custom items. Similary to a combobox in functionality, listboxes can be used for much longer lists that users can scroll through. Double-clicking on a listbox item will send a channel message to Csound. align("position") Aligns the widget's text. "position" should be 'left', 'right' or 'centre'. channeltype("type") Specifies the type of channel. Default is "float". If you wish to send the text contained in the combobox, for examples the names of a set of audio samples, set type to "string". 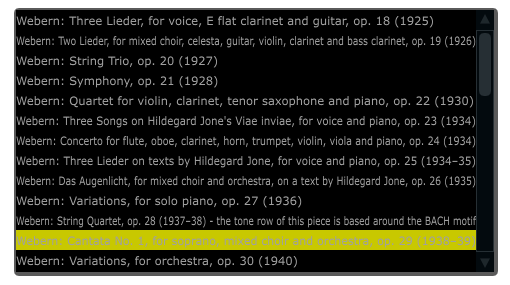 If type is not set to string the index of the selected item will be sent to Csound on the named channel. file("filename") Using this identifier will cause Cabbage to load lines from the given file into the combo box. If a full file path is not given, file() will search in the current directory, i.e., the directory that contains the csd file that is open. It is best to keep all files in the same directory as your csd file, but if you wish to keep them in a sperate folder you can pass a full path to the file() identifier. highlightcolour("colour") Sets the colour of the selected text. See above for details on valid colours. items("item1", "item2", ...) list of items that will populate the combo box. Each item has a corresponding index value. The first item when selected will send a 1, the second item a 2, the third a 3 etc. If this identifier is left out default values of "Item 1", "Item 2", "Item 3", "Item 4" and "Item 5" will be used.